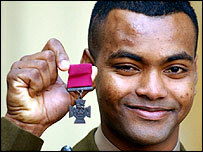 Iraq war hero Private Johnson Beharry has been awarded the Victoria Cross by the Queen at Buckingham Palace. Pte Beharry, 25, who was twice injured saving colleagues under enemy fire, is the first recipient of the UK's highest valour award since the Falklands War. He was told by the Queen: "You're very special". "She said that she doesn't get to present the VC very often," Pte Beharry, of London, said afterwards. Record-breaking yachtswoman Ellen MacArthur was also made a dame. 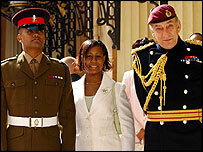 Pte Beharry, who was born on Grenada in the West Indies, is the first living soldier to be given the VC since 1969. He was at the head of a five-vehicle convoy when it came under attack in the town of al-Amarah on 1 May 2004. He guided the column through a mile of enemy ground to drop off wounded comrades, at great risk to his own safety, his citation said. Weeks later, his vehicle was hit by a rocket-propelled grenade round. Despite a head wound, he managed to reverse his Warrior to safety. Pte Beharry is still recovering from serious head injuries. "When I hear what I did, I can't really believe it was me," he said at Buckingham Palace on Wednesday. "But what I did was my choice - I knew I had to get everyone out because I wouldn't have been able to live with myself otherwise. "I think it's the training that just kicks in." The UK's top soldier, General Sir Mike Jackson, was knighted by the Queen, receiving the honour of Knight Grand Cross of the Order of the Bath. He said: "I was overshadowed today by Pte Beharry, and quite rightly so - it was an honour to stand alongside him." Other members of Pte Beharry's regiment, the Princess of Wales' Royal Regiment, were also honoured. Lieutenant Colonel Matthew Maer and Major James Coote received the Distinguished Service Order. Sergeant Christopher Broome received the Conspicuous Gallantry Cross. Warrant Officer David Falconer, Sergeant David Perfect, Corporal Brian Wood and Private Troy Samuels were awarded the Military Cross, along with Lieutenant Richard Deane of the Royal Irish Regiment. 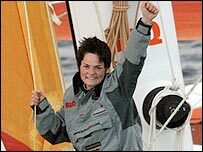 Yachtswoman Dame Ellen MacArthur was made a dame for achieving the fastest solo circumnavigation of the globe, in 71 days, which she concluded in February. Others collecting honours at the investiture included Bafta-winning veteran actress Anna Massey, star of Hotel du Lac, who collected a CBE - Commander of the Order of the British Empire - for services to drama.